One of the things that I truly enjoy about working with Plant With Purpose is discovering new ways in which Plant With Purpose’s work overseas “crosses over” to gardening and creation care opportunities here in the U.S. I discovered one of these recently in Tanzania in the shape of the “Bag Garden-“ (see picture below.) There are lots of cool things about the bag garden. It allows you to grow a lot of vegetables in a small space, it saves water, keeps pests away and lasts about 4 years before it needs to be redone. 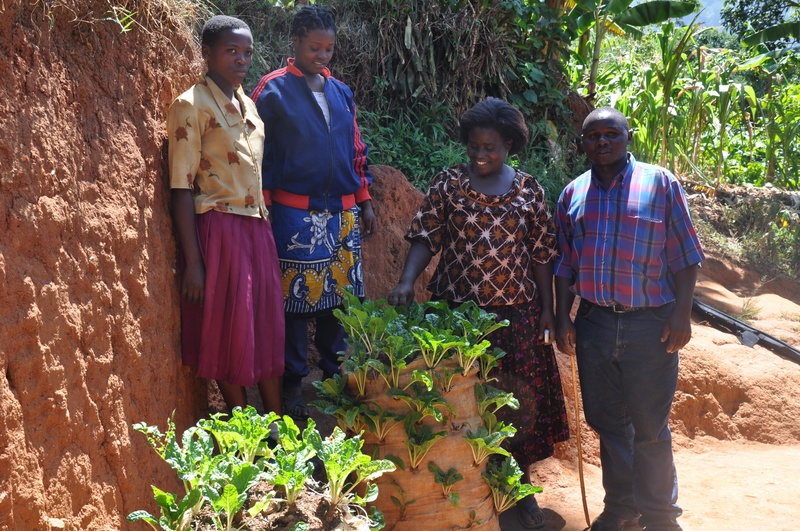 For Plant With Purpose’s farmers in Tanzania, the bag garden does all of this and more- it also provides an additional source of income, as extra vegetables can be sold in the local market and provide much needed funds for school fees and books, medical bills and other necessities. In the case of Leni, pictured here with one of her bag gardens, the bag garden is one of the things literally saving her life. Leni is living with AIDS. Abandoned by the husband who infected her and ostracized by her community, she is nevertheless bravely continuing to raise her children. Government-provided drugs are controlling the disease, but for lasting improvement in her health, medicine must go hand in hand with improved nutrition. That’s where the bag garden comes in. Since working starting to work with Plant With Purpose. Leni has put on almost 30 pounds and has hope for the future. You and I may not share Leni’s dire circumstances, but we do have other things in common- such as a need for healthy, organic food, and, oftentimes, limited space in which to plant. If you’d like to learn a great new way to grow food, here’s how you can make Leni’s bag garden. Second, get a large burlap bag or feed sack and fill the bottom six inches with soil. Insert the broom handle into the middle and hold it upright while filling the rest of the bag with soil. Third, compact some of the soil around the handle by gently pushing it outward. The idea is to compact enough so that you can then remove the handle and pour the gravel down the center hole. This provides a way for the water to reach all the way through the bag. Fourth, with a sharp knife, cut three-inch slits space about 6 inches apart, all over the bag. Finally, carefully insert vegetable starts in all the slits and water thoroughly. You can also plant starts around the top of the bag. Your bag garden is ready to grow! After a plant has been harvested, simply put another one in its spot. Your garden should be good for four years, or until the bag wears out. Gardening is that it is an activity that we can share with brothers and sisters all over the world, regardless of our background or circumstances. It also gives us great opportunities to learn from each other. People like Leni have a lot to teach us about living in harmony with creation and growing some great vegetables in the process.